A 14-year-old from Rhode Island, Nicholas Lowinger, was chosen as a 2012 Huggable Hero, winning $10,000 for his outstanding work in public service. The boy's foundation, Gotta Have Sole, donates new footwear to children living in homeless shelters. New shoes not only provide the perfect fit for a child, but they also instantly increase a child's self-esteem. To date, Nicolas has purchased 5,000 pairs of shoes for homeless kids by collecting donations worth $200,000. "I decided to give shoes because shoes take you places," said Nicholas. "You can't really go somewhere without shoes... and clothing is something people regularly donate to shelters." To commemorate the tenth anniversary of the 9/11 terrorist attacks, Nicholas held a special event to collect and send new footwear to more than 90 children of the first responders. 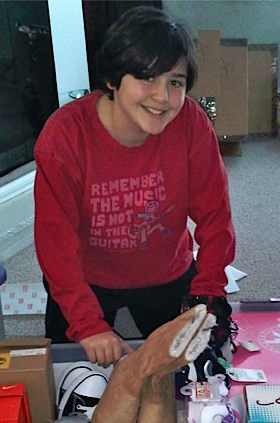 Nicholas was named one of 15 “Huggable Heroes” by the Build-A-Bear Workshop this month, winning ten thousand dollars and earning a scholarship for himself, as well as $2,500 for his charity.